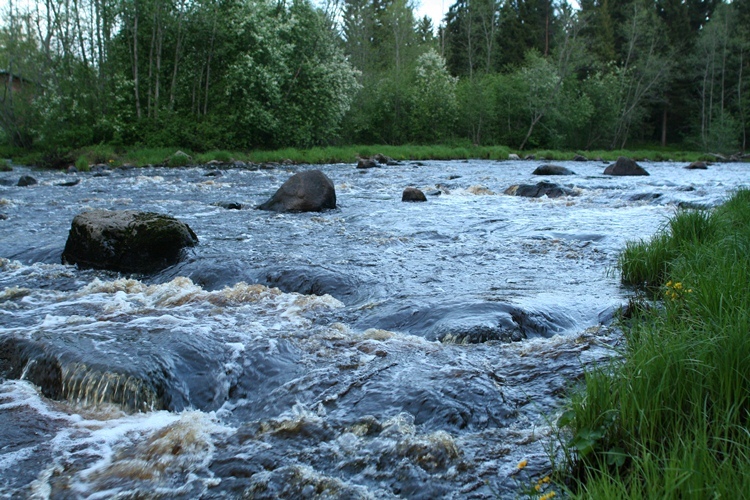 Niskakoski is one of the riffle sections in the River Vääräjoki where in-stream restoration measures were conducted in late 1990s. The river is altogether 107 km long and descends 110 metres from its origins to the point where it reaches river Kalajoki. Most riffle sections of the mid reach were restored from channelization for timber transport and flood protection, but the riffles in upper and down reaches of the river are still channelized. There are plans to continue the restoration work and restore the old riffles also at other reaches. Water quality of the river is deteriorated due to considerable human activities in the catchment (particularly forestry and agriculture). In-stream restoration measures were conducted in late 1990s to enhance stream habitat diversity: The stream bottom was rearranged using boulders that were removed from the channel and placed along stream margins during channelization. Also gravel beds were created to provide nursery habitat for salmonids. Length of restoration: Altogether over 5 km of the river was restored in 1997-2006 (consisting of multiple riffle sections).